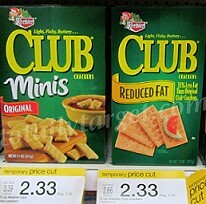 Keebler Club Crackers only $1.13 w/ Coupons! You can get a good deal on Keebler Club Crackers at Target by stacking a few coupons! = $1.13 each after stacking coupons! Thanks, Totally Target for deal and photo!